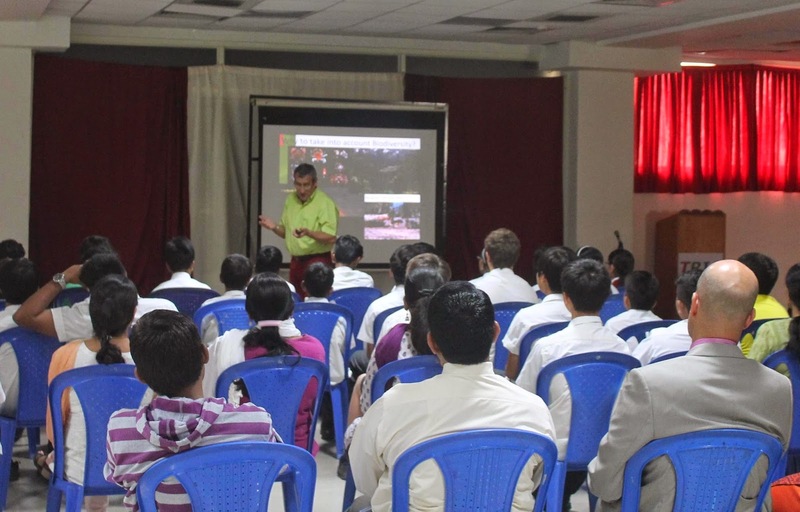 Bangalore, 26 February, 2015: Renowned professor and Director of National Museum of Natural History, Paris, Gilles Boeuf addressed the students of TRIO world School about the importance of biodiversity and oceans at a Lecture conducted at their campus today. Prof Gilles spoke to students of TRIO World School about biodiversity crisis, threatening the contamination of national environment. He said there is an urgent need to devise measures to counter the diverse effects of overexploitation. He told the students that it’s high time we mend our ways and protect biodiversity. ProfessorGilles BOEUF is the Director of the Natural Museum of Paris. He holds the annual Chair in “Sustainable Development - Environment, Energy and Society” at Collège de France. He is specialized in environmental physiology and biodiversity. Professor Boeuf is knight of the French National Order of Merit, and he is also National adviser Biodiversity to the French Government. He teaches in several Universities, mainly at the Université Pierre & Marie Curie, and is the President of the National Natural History Museum in Paris since 2009. He is touring South India for a cycle of conferences about his predilection subjects: biodiversity, climate and oceans.